Posts having to deal more specifically with Feminism or gender inequality. Aesthetics carry messages about values. Star Trek, while frequently written about in historical, literary, and technological terms, was also a visual experience with a distinctive aesthetic, and there’s a lot there to talk about! I just wrote a term paper on the topic, and it’s my pleasure to bring you some highlights related to Star Trek’s costumes — specifically, the infamous miniskirts. William “Bill” Ware Theiss, a gay costume designer at the beginning of his career, developed the costumes for the full run of the show. The iconic uniforms were the third version developed over the course of several pilots, and their final form was a combination of practicality and aesthetics. The two earlier styles made use of velour tunics, chosen for their futuristic sheen under stage lights. Velour shrinks with every wash, though, and since television costumes are laundered every day, the tunics had to be continually refitted for the actors. The uniform colors, along with brightly-colored sets and lighting, were chosen in part simply because color televisions were becoming common in the United States in the mid-1960s when Star Trek first aired. The parent network, RCA, even advertised their color TVs by telling customers how good Star Trek looked on them — The bright red color in particular was added to blue and gold versions because it was “RCA color TV-friendly.” The final effect is sleek and colorblocked, a “futuristic” impression largely stemming from minimalistic styling. The bright colors and figure-hugging cuts also project a confidently eyecatching demeanor. Ghostbusters – the worst movie trailer ever? When I was seeing news about a reviled trailer for the Ghostbusters movie I figured that a new trailer had hit and that it was truly bad. So I went and looked, and… nope. Just the same one. A trailer that has over 31 million views, over 230,000 likes right now, and over 740,000 dislikes. I mean, that’s approaching the levels of something like Rebecca Black’s Friday. Meaning either a) it’s being shared around because it’s so bad and others are agreeing and disliking it… or b) it’s being deliberately targeted with bad blood to dislike it. Ask the director, Paul Feig, and it seems he has an answer on that. I found the quote on The Mary Sue, but reading the original interview piece was more revealing. Quick thoughts on Spy: it reminded us a lot of the recent Get Smart (in fact, we watched Get Smart the week after and were amazed how much they are reminiscent). However, unlike Get Smart, where the new spy is competent but ends up with a lot of slapstick and accident sort of jokes around him. Melissa McCarthy in Spy is competent and a lot of the jokes are around people not expecting her to be competent, things like her awful cover identities. So was the Ghostbusters trailer the best thing ever? Nah. Are there legitimate reasons someone might not be happy for the movie? Sure – we’re tired of reboots, why is it a reboot instead of a 30-years-later, it’s looking like a grosser movie than the originals… But I mean, the original was made by a bunch of comedians, and this one’s a bunch of comedians. It’s 30 years later, things change. But do I think these are the reasons why trolls are trolling and disliking this movie trailer? Nope. Do I trust Paul Feig, with that track record of movies, to deliver? Do I trust that cast to deliver? Yes, I do. Do you? 4/20/2016 – I edited the post for clarification. This is meant as a look at the song Poor Unfortunate Souls and how it relates to real life comments and thoughts by some people. I did not mean it as a look at the character or story of the Little Mermaid as a whole or as an analysis of the Disney Princesses. Now I am a huge Disney fan and I do love the Disney movies, but honestly a lot of it has to do with the music and the songs. I know all the songs by heart and I can listen to a Disney soundtrack over and over again. Well recently I was listening to the song “Poor Unfortunate Souls” that was sung by Ursula when trying to convince Ariel that she has the solution to her problem. At the same time if you think about the song comes down to convincing Ariel to trade everything about who she is to get a man, which actually cuts close to real life situations that women find themselves in. It occurred to me recently that Lieutenant Uhura, the Enterprise’s communications officer, portrayed by the formidable Nichelle Nichols, wears a red uniform. This may not be immediately surprising. Lots of people wear red uniforms in the Original Series. All the nameless “redshirt” security guards, yes, but also the entire engineering department, which naturally raises the question: Which is Uhura? Not security, clearly, which leaves engineering. This realization struck me because fans seem to have conflated “communications” with linguistics at some point after the original series, largely due to the 1985 novel Uhura’s Song by Janet Kagan. In actual episodes, though, she’s not presented as a linguist but an expert in the sophisticated technology required for the Enterprise’s communications, including long-range with Starfleet, intraship coordination, and interfacing with alien ships’ technologies. She doesn’t pull out a dictionary, she crawls under her station to reconnect wires. She’s in the engineering department, not the humanities. A few examples: In “Who Mourns for Adonais?”, she pops under her station to “rig up a subspace bypass circuit,” identified as “very delicate work.” Spock comments that no one else is more qualified to do it and leaves her alone. Spock. Spock doesn’t think he himself could do a better job on that circuit. (Nichelle Nichols has also commented that she saw Uhura’s relationship with Spock as one of a student and mentor). Another one, easy to miss, is tossed in at the beginning of “The Gamesters of Triskelion.” The initial goal, before they were waylaid by the gamesters, was a maintenance check on an automated communications outpost, so Uhura is tapped for the landing party. Uhura is shown speaking Swahili on multiple occasions, it seems to be her first language, and that may be part of the reason her character is nudged that way later. However, it’s generally presented as character backstory and part of an effort to show people of all nationalities on the Enterprise, not connected to her professional qualifications. Think about it: With a universal translator, why would they need a linguist on the bridge? On the ship as a backup, certainly, but not on the bridge. This matters, not because linguists are dumb — it’s just as valid as any other profession and super interesting! — but because Uhura is not a linguist, yet is continually pushed in that direction, a more “feminine” direction. It matters because we still have so few representations of women in STEM fields, let alone women of color, and one representation makes all the difference. Before 1985, Uhura was a symbol drawing women into NASA and the STEM fields at large, and she deserves a little recognition! Author’s Note 3-25-16: This is my personal reaction to the speculation surrounding the news that a Xena pilot has been ordered for a reboot. Obviously the world of TV is ever-changing, and this is all very early conjecture. 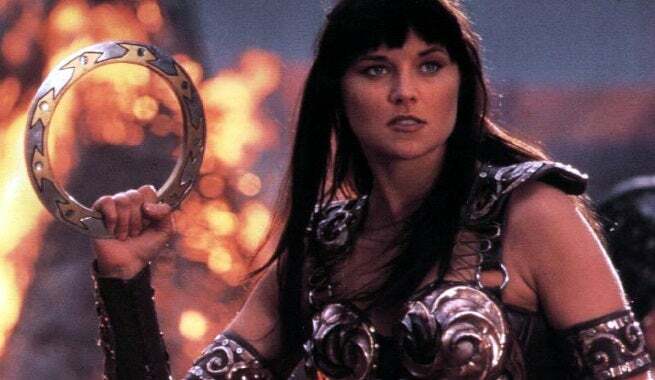 It’s funny that this news came out last week because I’ve recently been trying to re-watch the original Xena these last few weeks on Netflix. So far it’s been slow going; I have to watch it in bits and pieces because otherwise I feel overwhelmed by the ’90s and nostalgia for my childhood. I felt conflicted at first when I heard the news about the Xena reboot, but probably not for the reason a lot of other people are. The producers have revealed that in the reboot, Xena will be an out and proud lesbian. This is huge and wonderful news, because a key relationship that was only ever sub-textually hinted at in the original will now be a main focus of the reboot. For a mainstream network (rumors are saying the pilot is being put on by NBC) this is a huge leap forward. I’m happy, and definitely want to see what a 2016 Xena show could look like. Better graphics, better writing, there’s so many possibilities for improvement. But I’m also a little disappointed. In re-watching the show, my honest opinion is that Xena is bisexual. I’m sure a lot of that comes from the fact that they had to show relationships with men to draw a more mainstream crowd in the ’90s, and they couldn’t do more than hint at a relationship with Gabrielle. The fact that they felt that they had to choose only between two options for the reboot, though, is part of a bigger problem with bisexual erasure in our culture.